Leasing land in the upper Wairau valley, John Cooper and Nathaniel Morse brought the first sheep into the valley, via the Tophouse Saddle from Nelson, in November 1846. In August 1847 Frederick Weld and Charles Clifford shipped another flock across Cook Strait from Wairarapa to graze in the Flaxbourne River area behind Cape Campbell. 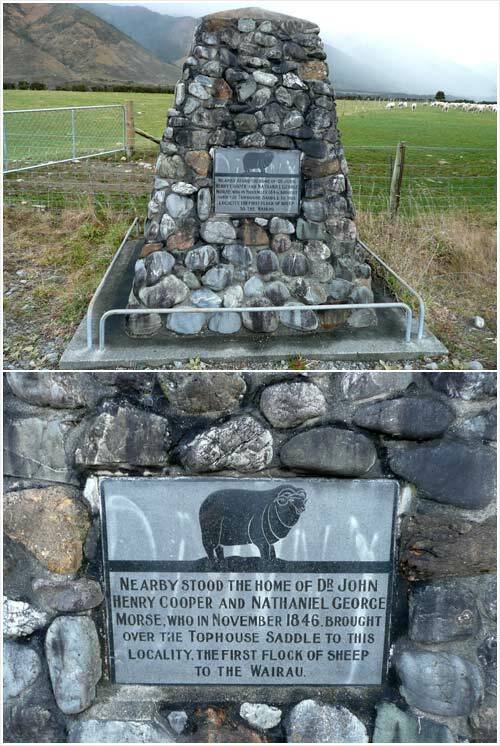 This monument to Cooper and Morse is on State Highway 63, in the upper Wairau valley.